One of the most critical events of birth is the conversion of the fluid-filled lung, unimportant to fetal intrauterine existence, into a hollow organ distended with air and capable of gaseous exchange sufficient to support life. Indeed, it has been argued that the major determinant of perinatal survival is respiratory function (Wigglesworth and Desai 1982). The failure to make this conversion adequately may lead, directly or indirectly, to infant death, and the pathologist often needs to assess the contribution made by respiratory inadequacy to the sequence of events leading to death. In the preterm infant, problems are mainly related to pulmonary immaturity and associated therapy. In the mature infant, birth asphyxia primarily results in cerebral damage but can engender significant respiratory complications when associated with aspiration of meconium. 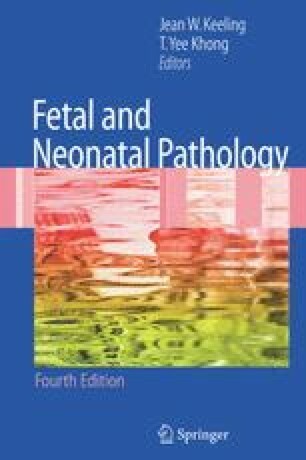 Even in stillbirths, where primary pulmonary pathology is rarely a cause of death, lung pathology may provide clues to antecedent events. Poor lung growth and maturation may point to the presence of pathology elsewhere. Consequently, adequate pathological investigation of the fetal or infant respiratory system is critical in any perinatal autopsy.